This recipe is truly simple and seriously satisfying! 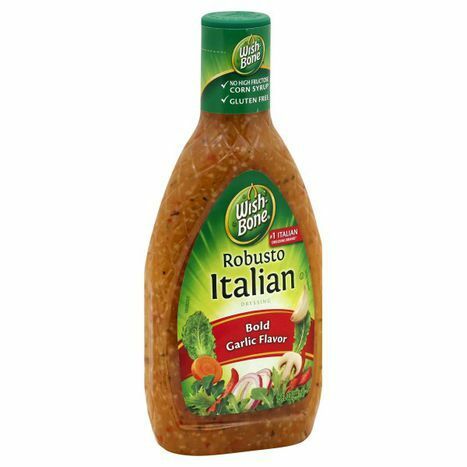 I’ve mentioned more than once that I’m a big fan of Wish-Bone Robusto Italian Dressing. It’s not only great on salad; it does a great job of marinating meat also. Wish-Bone Robusto Italian dressing is kicked up a couple of notches from the usual Italian dressing ~ packed full of herbs, seasonings and cheese flavors for a taste that’s zesty and robust. 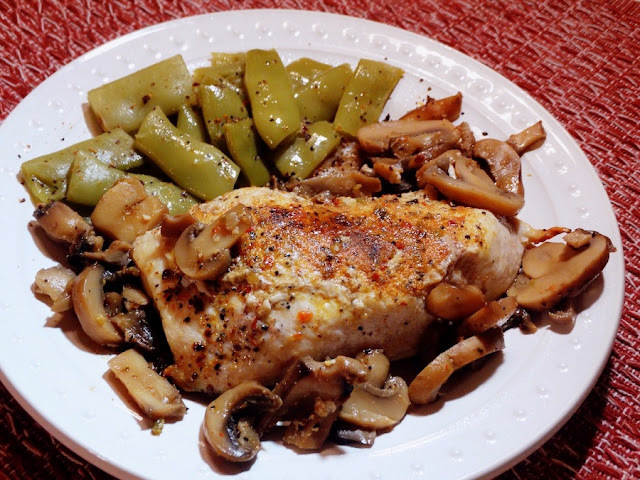 It’s perfect for this chicken and mushrooms we had for dinner recently! This no-fuss dish for dinner needs nothing special in the way of ingredients, and very little prep work. Substitute thighs or wings, if you like. Serve the chicken with a salad and green beans on the side; mashed potatoes or a crusty bread, now that’s good eating! Hope you give this zesty dish a try! For easy cleanup, line a 13x9x2-inch baking sheet with parchment paper. Place chicken on sheet pan, and mushrooms around them. Combine remaining ingredients and pour over all. Bake for 35-40 minutes, until instant thermometer reads 170° and chicken is fully cooked and browned. Oh, lucky wife, more mushrooms! It's a great marinade for meat and pasta salads. Thanks, Dave! I adore simple, healthy and satisfying meals like this. Thank you for sharing, Pam. Hi Diane! As a sub, I guess add a lot of Italian seasonings and garlic to regular dressing. Take care! Thanks, Amrita! Glad you like it! We love one-pan recipes quick to cook and easy to clean up for our weeknight dinners. I'm thinking those mushrooms soak up all the chicken juice and end up tasting very yummy. Pam when we moved over here and I got my BBQ setup, I went to the market looking for Wishbone dressing for my BBQ chicken. Not to be found, imitations sure but not the real deal. The closest I've found is Knorr Italian dressing in the dry packet, close but not Wishbone. Thanks for sharing a great recipe idea. Thanks, Larry! It's a wonderful thing. Sounds like a flavorful and delicious chicken dish! The chicken looks so delicious! I'm not sure I can find Wishbone over here. Thanks, Joyce! It's a great dressing, hope you can find it! Great dish! Love the sounds of using this dressing as a marinade -- gotta try that. And gotta try this dish, of course -- looks scrumptious. Thanks! This sounds like a recipe to keep in one's back pocket. I'm really going to look into this Wishbone dressing. Generally I always whip some up but I need this in that pocket, too! This sounds really homey and comforting. And easy! Thanks, Jeff! It's easy for sure and good! When I was a little kid we thought Wishbone Dressing bottles were beautiful and were always trying to figure out what we could do with them. I'll tell you: there aren't very many craft projects that can use them. Maybe that just shows that my lack of faith in craft projects started early! 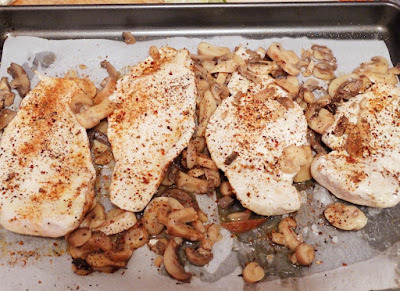 Your photo of the plate of chicken with mushrooms looks good. Ha! Funny good story,Mae! I agree with craft projects though, not my thing. Those bottles are pretty though . 🙃. Have a good rest of the week! This meal has the word perfect all over it! What a yummy recipe! I need to buy a few packets of Wishbone dressing so I can whip this up whenever I want. Love easy, flavorful dished like this for a weeknight meal!